Unani is the Arabic word for Ionian, or Greek. Greece's Islamic neighbors call Greece Yunanistan, or the Land of the Unanis. While Western Europe was in the Dark Ages, Greek Medicine and other branches of classical science and learning found a safe haven in Islamic lands. But Greek Medicine didn't remain static or unchanging; it continued to grow and evelve as Muslim scholars and physicians continued to make important discoveries and contributions of their own. In the process, Greek Medicine was "Islamicized" into Unani-Tibb, or Greco-Arabic Medicine. This transformation proved that Greek Medicine was flexible, resilient and adaptable enough to absorb and incorporate new developments and influences. Within a few short centuries after its birth, the Islamic world had expanded to stretch from the Atlantic ocean in the west to the Indian ocean in the east, from Moorish Spain to the plains of Hindustan. Everywhere the Muslims went, their Unani physicians went with them, adapting themselves to the local conditions and resources. In the words of Unani medical historians, Unani Tibb enriched itself by imbibing new medicines, techniques and treatments from the various cultures and medical systems with which it came into contact, which included Indian Ayurveda and Oriental Medicine. Around the time of the Crusades, the Islamic world produced a few very prominent and influential physicians and medical scholars. Their names were Latinized, and their medical treatises were imported into Europe and translated into Latin, to serve as texts and reference manuals in the medical schools that were just starting to spring up in Medieval Europe. Ibn Rushd, or Averroes (1120 - 1198) was a physician and Islamic scholar and philosopher in Moorish Spain. He wrote a five volume treatise on medicine called Al-Culliyat (The Fundamentals), or Colliget. Al-Razi, or Rhazes (865 - 924) was a Persian physician, chemist and alchemist. He wrote a vast medical encyclopedia called Continens, with many excerpts from Hindu and Greek medical sources. 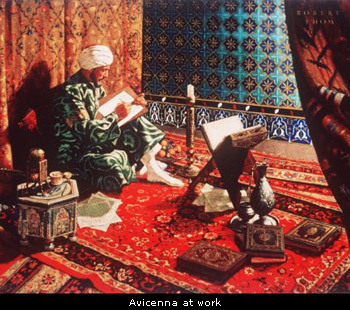 But the greatest of these was undoubtedly Hakim Ibn Sina, or Avicenna. He wrote a five volume treatise called The Canon of Medicine, which became a standard textbook in European medical schools. Today, it serves as the basic handbook for all practitioners of Unani Medicine. Unani Medicine found fertile soil in India. The Delhi Sultanate and later the Moghul emperors were great patrons of medicine. Many eminent physicians from Persia and Central Asia came to India not only to seek fame and fortune, but also to find a safe haven from the wars and strife devastating their homelands. Under British rule, all forms of healing except conventional allopathic medicine were discouraged. But Unani Medicine survived, due to its popularity with the masses, and the safe, gentle yet effective nature of its treatments. Hakim Ajmal Khan (1864 - 1927) was an Unani physician, and also an Indian patriot and freedom fighter in the struggle for independence. He was also a great advocate and champion of the indigenous systems of Ayurvedic and Unani Medicine, and pioneered scientific research into their treatments. Today, the Indian government supports and subsidizes both Ayurvedic and Unani medical colleges and hospitals. But whereas Ayurveda has enjoyed a phenomenal surge in popularity, Unani Medicine still lags behind in recognition, perhaps due to its minority Islamic associations.